But before giving you this new information we would prefer to express our gratitude to all the volunteers who have helped us troughout the years! Thanks to your assistance, we are able to share our products all over the globe. Your translations are a great contribution to our cause. We have a lot of competent translators who are continuously working on different AdGuard localizations for a long time. If you want to join them, go to our page on OneSky, sign in and start translating any project you like right away. We do hope you enjoy translating AdGuard, but of course every good work should be rewarded. Good news for all volunteers who actively translate on Oneskyapp — you are eligible to request free AdGuard lifetime license key! Just send us a request to this e-mail: translate@adguard.com and you’ll get the license key as a token of our gratitude. Returning to our main subject: we are always looking for ways to improve our system of working with the translators. This brings us to this topic — choosing a moderator for each language. There are several key responsibilities Moderators will have. Moderators have to take part in discussions in comments and timely react the Admins messages. As for other languages (such as German, Japanese, Spanish (Latin America), Portuguese (Pt, Br), Danish, Norwegian, Czech, Slovak, Estonian, Serbian, Turkish and Korean), the moderators have already been chosen for them. Ok, time to get to the good part. First of all, every moderator may, of course, request free AdGuard license keys. But that’s not all! 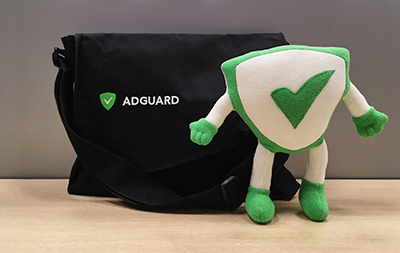 If a moderator successfully carries out his or her activities for ~2-3 months, he or she gets a giftpack containing various souvenirs with AdGuard symbolics (like backpacks, hoodies, toys, stickers etc. — the exact contents are yet to be decided). Do you want to be a moderator? Then fill in the following questionnaire and send an e-mail to translate@adguard.com. What language would you like to be a moderator of? Do you have any translator/moderator experience? Why should we choose you as a moderator? If you have any questions, include them into your email as well. Hope to see you in our team soon!